President Obama has long expressed concern about climate change and its impacts, and was mocked by Mitt Romney for saying he wanted to stop the rising of the seas. But climate change activists have been dismayed that the president nevertheless spoke of an “all of the above” energy policy, urging further oil and gas exploitation, talking about unicorns like clean coal, and generally doing little to tackle the enormous problem. The US emits 5 billion metric tons of carbon dioxide a year, more than any country save China. A large proportion of the extra carbon dioxide in the atmosphere was put there through the past 150 years by the US itself. While the emissions have fallen by a billion metric tons a year recently, that fall came about largely because of the poor economy and increases in wind and natural gas power, replacing very dirty coal plants. This reduction has been touted by the Obama administration. But really folks, if a morbidly obese person is warned that they will die if they don’t lose 600 pounds, and they try and try over 5 years and manage to lose 100 pounds, you don’t pat them on the back and say ‘well done!’ You say, what are you thinking, you need to lose another 500 pounds or you will die! Obama’s relatively lackadaisical approach to climate change was challenged a few days ago by his own office’s report on the problem. It is said that Obama was disturbed by the White House report and feels a new urgency to move on the green energy front. Since the president faces an extremely hostile House of Representatives that would gladly ingest arsenic if Obama spoke out against the dangers of arsenic, he has little hope of enacting new legislation on renewables. Therefore on Friday, President Obama used policy directives and executive orders to push for more solar energy aimed at helping the solar industry finally take off. This set of commitments is very welcome, but it just has to be said that it isn’t nearly enough and does not express the sense of urgency on this issue that climate scientists such as James Hansen have insisted is necessary. In the medium term, Obama’s use of the Environmental Protection Agency to close the dirtiest coal plants will reduce CO2 emissions far more than will the new solar panels Obama is seeking to install or facilitate the installation of. The US has just enormous solar potential on rooftops throughout the country but especially in the South, Southwest and West. Plus utility scale solar would be easy in the Southwest. But the grid has to be built out and solar has to be integrated with wind, hydro and hydropumps if we are to take full advantage of our solar bonanza (the US is way sunnier than virtually anyplace in Europe but Germany is tremendously ahead of us on solar power). Even in the upper midwest, my 16 rooftop solar panels nowadays are generating 90% of my electricity needs and also fueling my hybrid electric plug-in car (a Chevy volt). Why everyone who can afford it doesn’t do this (it saves money in the medium to long term) is beyond me. 10 percent of Germany’s electricity now comes from solar. In the US it is still only 1.13 percent– even thought the PV panels are much cheaper now than when Germany put most of its in. Obama’s team notes that a third of all new energy generation in the US in 2013 was from solar. But solar is still an extremely small part of our energy mix, because we are starting from such a low level. So the morbidly obese person still needs to lose 500 lbs quick, or else. It seems to me that providing innovative financing for installing solar panels is one of the more important steps that could be taken. In fact, utilities themselves should start installing solar for nothing or very little down, so that they can benefit from profit sharing with consumers and can cut down on a foreboding up-front expense. Obama is right that for the government to throw billions at solar will likely reduce the costs of the solar panels through innovations in technology and economies of scale– just they have become 50% cheaper in the past two years. It is much easier to save carbon emissions through efficiency than to generate energy with less emissions. 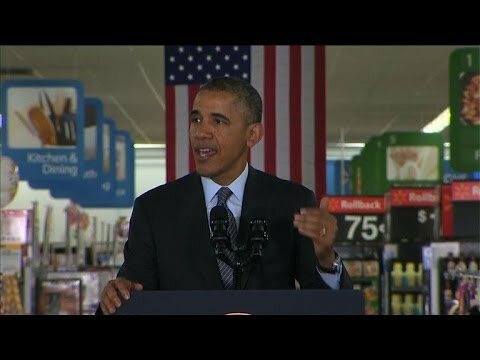 Obama is therefore setting new standards for freezers and refrigerators (currently carbon spendthrifts), noting: “Through 2030, these standards will help cut carbon pollution by about 158 million metric tons – equivalent to the annual electricity use of more than 21 million U.S. homes and will save consumers over $26 billion on their energy bills.” But note that in 16 years at today’s emissions rates, the US will put out 80 billion metric tons of carbon dioxide. So this savings is a drop in the bucket. Obama’s highlighting of solar power is a welcome step, and some of what he announced will be consequential. But let us face it, these are baby steps when we need a vigorously run marathon.